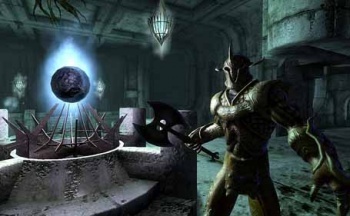 A mold-breaking new Elder Scrolls is supposedly in the works, and is already at the stage of recording voices. An anonymous source - who is reportedly so close to Bethesda that he had design documents in his hand - has suggested that the fifth Elder Scrolls game will be a direct sequel to 2006's Oblivion. This would be the first time that an Elder Scrolls game had directly followed its predecessor. A member of Eurogamer Denmark's editorial staff reportedly was able to coax certain details about the game from the source while on a plane. Apparently, an NDA prevented the source from saying too much, but he suggested that the game would once again feature the Blades, the Emperor's elite guards and spies, and something referred to only as the "Dragon Lord." Bethesda is reportedly recording voiceovers for the game in the next few weeks, which suggests that the game is in the later stages of development, as it means that the story is finalized and all the dialogue is written. It's hard to know what to make of these rumors, because "direct sequel" is a fairly vague term. It implies that you will play the same character you played in Oblivion, but says very little else. A direct sequel could be set immediately after Oblivion, where you and the Blades must deal with the aftermath of the demonic invasion as it happens, or it could be set years later when some new danger is threatening all of Tamriel. Of the two, I'm hoping it's the latter, although ideally, it will be something new entirely, rather than another trek round Cyrodiil. Besides, my old Oblivion character has more than enough to do as the champion of the Imperial Arena, archmage of the Mages Guild and head of the Fighters Guild, without adding another grand adventure to his to-do list.